Without question the reason most tourists visit Monforte de Lemos is to see, or stay in, the former "San Vicente" Monastery, now a parador (state run hotel). 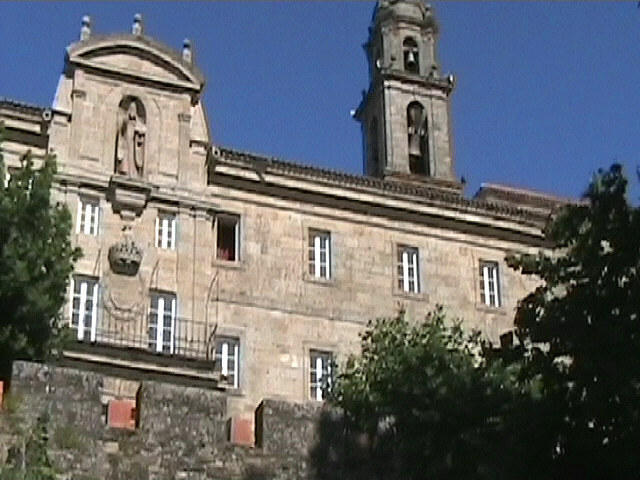 The monastery, called "Conxunto Monumental de San Vicente e Parador National de Turismo", is perched at the top of a steep hill in the center of Monforte. You can drive up to the site where the Parador has a small car park or, as we did, take the 10 minute walk directly to the building. There are actually two routes you can walk, the path that we took or, alternatively, a longer more winding path that follows the road and takes a little longer. The walk is short but hard, however the reward when you reach the top is a spectacular view of Monforte de Lemos below and the expanse of land and mountains in the distance (see right). On the day we visited the sky was clear, but the air full of microscopic debris from the forrest fires and the view was slightly hazy. Surprisingly, when you reach the monastery both it, and the large tower to its side, seem slightly less gargantuan than expected, but impressive none the less. There are actually three structures that form part of this hill top retreat. 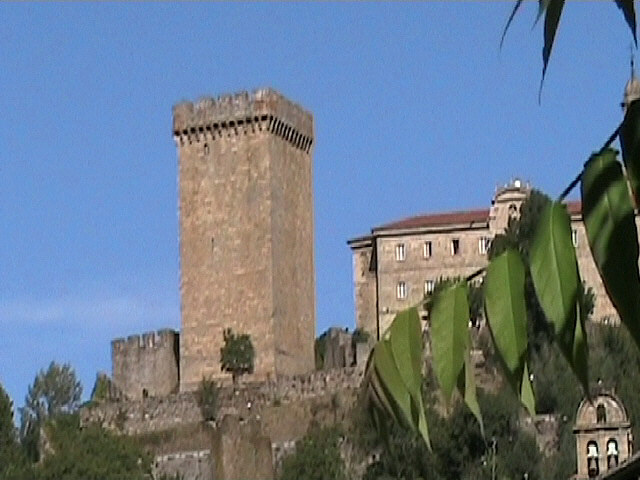 The most obvious is the large vertical castelated tower that appears to the left of the main complex. You can enter the base of the tower for free, but it will cost you 1.20 Euros to climb the towers internal stair. It was a very windy day at the time and there seemed to be no takers, although I am sure the view would be worth the cost. Below the tower adjacent to the main building. To the right of the tower is the main habitable structure of what was once the monks abode. Today it is impossible to gauge what it must have been like since its conversion to a parador has replaced the impoverished suroundings the monks once endured with the most opulent of decor. If the word parador, and its association with state ownership, suggests economy and frugality, you have jumped to the wrong conclusion, the paradors are the height of Spanish hotel accomodation. Externally the monastery is grand, but difficult to photograph because of the slope that leads up to it. One thing I noted, at the entrance to the monastery building, was the presence of a stair lift for anyone in a wheelchair - beleive me, this is almost unique in Galicia and takes away the excuse, used so often, that access for the disabled is not possible or aesthetically acceptable on old buildings. 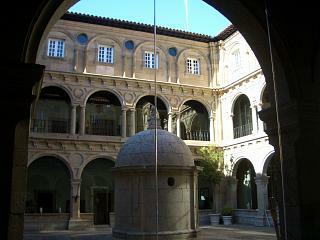 Right, a shot of the large building that once acted as the monastery of San Vicente. Once inside the structure you are left in no doubt as to its current use, it is clearly a hotel, but as a cultural tourist you are allowed to walk round it at your leisure. The once entrance of the building is now the hotel's foyer, but you need spend no time here as it is the area immediately beyond this point that offers the internal highlight. After you walk through the foyer you enter what must once have been the cloisters, but now form a square corridor, lined with glazed arches around a central open air atrium. The suroundings and furnishings are plush, but some how the sight retains its impact and you get a brief glimpse of how things used to be. The photo to the left gives you a view through one of the archways and across this central square. If at this point you feel the need for refreshment, there is a cafe area where you can relax and take your favourite tiple. That done, you have seen the monastery and Monforte de Lemos and you have the consolation of knowing that the route back down to town will be easier than the one that led you to your present position. Are Monforte de Lemos and San Vicente monastery worth a visit? All I can say is look at the pictures, read the description and decide for yourself. 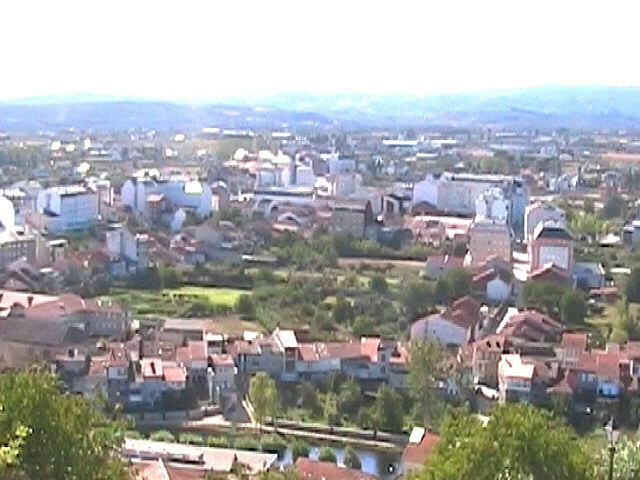 Parts of Monforte are far from picturesque, but we liked it and it made a change to see an inland town in Galicia.